The main Earth Science funding agencies in the United Kingdom and the United States are teaming up to investigate a massive, rapidly changing glacier in Antarctica. Together, the US National Science Foundation (NSF) and UK’s Natural Environment Research Council (NERC), will launch a $25-million multi-disciplinary effort to investigate ice loss on the Thwaites Glacier and project its future impact on global sea level rise. Thwaites Glacier and its adjacent area have been called the “weak underbelly” of the West Antarctic Ice Sheet (WAIS) because of its potential instability. With an area the size of Florida, it currently contributes about 4 percent of global sea level rise, with its flow nearly doubling since the 1990s. The NERC and NSF partnership, called the International Thwaites Glacier Collaboration (ITGC), covers research across Thwaites Glacier and its adjacent ocean region; the glacier flows into Pine Island Bay, part of Amundsen Sea. ITGC is the largest joint UK-US project undertaken on the southern continent in 70 years—since the conclusion of a mapping project on the Antarctic Peninsula in the late 1940s. Eight large-scale fieldwork and modeling projects aim to improve decadal and multi-century projections of ice loss from an already-accelerating Thwaites Glacier. The National Snow and Ice Data Center (NSIDC) will lead the Science Coordination Office (SCO), the ninth project funded, to help researchers communicate across landscapes and disciplines. “The Thwaites SCO aims to get the most out of the funded resources by sharing them across the projects—logistics, data, and outreach as well,” said Ted Scambos, senior research scientist at NSIDC and the US SCO principal investigator. 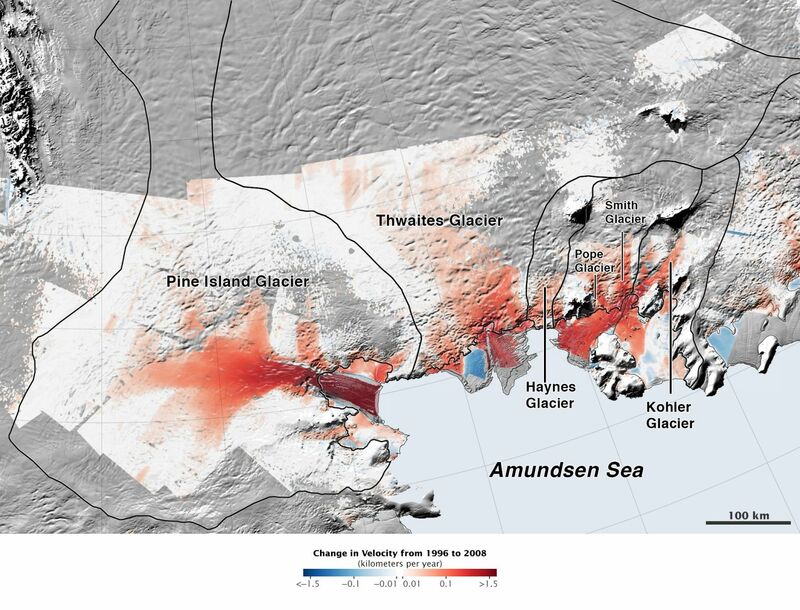 Future projections of Thwaites Glacier’s sea level contribution are uncertain. The potential for increased rapid ice loss and faster retreat are not well understood. “It’s sort of the wild card in our sea level forecasting,” Scambos said. “We need to better understand what processes might push it into this rapid retreat where it’s unloading ice a lot faster.” In some projections, Thwaites Glacier and the surrounding region could raise sea levels as much as half a meter (1.6 feet) in the next 100 years. Massive portions of Antarctica beneath the WAIS dip below sea level. 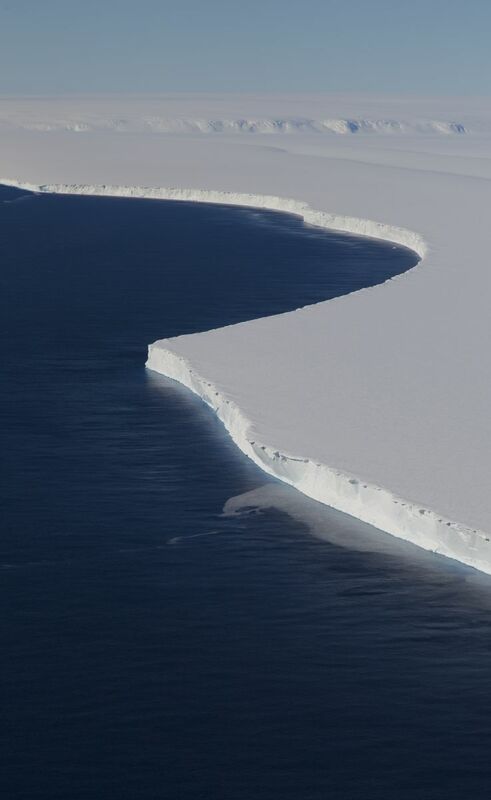 In theory, this inland slope inherently destabilizes the ice sheet, because as retreat begins, the floating ice becomes thicker, leading to more rapid ice flow and further inland retreat. Warm waters are already gouging out the underside and edges of the glacier, removing the basal ice, and causing the glacier to lift off the seabed. A second process may accelerate this loss further—extreme fracturing and breakup if the glacier’s front cliff reaches 100 meters (330 feet) or more. Ice is too weak to support such a cliff, so it will crack and fall into the sea. This leads to a new cliff, potentially even higher, causing another crack and collapse, and another. “That’s the runaway we’re most worried about,” Scambos said. So how much ice is there? “It’s a question of where you draw the line,” Scambos said. “A big retreat at Thwaites would trigger thinning in other areas as well.” Thwaites and its neighbor, Pine Island Glacier, sprawl across an 800-kilometer-long (500 miles) plain, widening and deepening inland to a reserve of ice two miles thick and larger than the state of Idaho. Eventually, in the following centuries, the entire WAIS would collapse, raising sea level by 3 to 3.5 meters (9.8 to 11.5 feet). This timing needs to be refined, as does scientists’ understanding of these potential events. To fully understand the causes of change requires research on the ice itself and the oceans around it. This international joint effort will deploy the most up-to-date instruments and techniques available, from ice drills that can make access holes with jets of hot water, to autonomous submarines, and even seals fitted with instrument packs. Nine proposals in total, and close to 100 scientists from more than 20 institutions will deconstruct nearly every physical aspect of Thwaites Glacier and the adjacent Amundsen Sea. 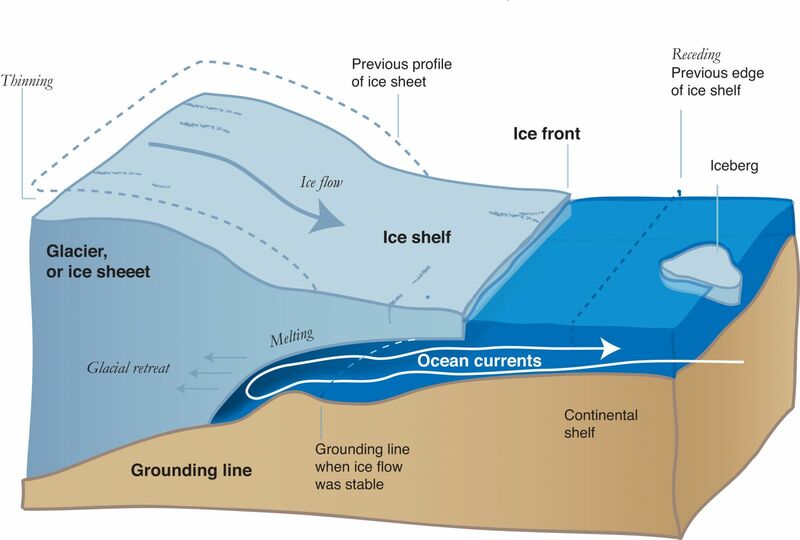 ITGC includes two modeling studies, one specifically focused on the ice-cliff effect, and the other aimed at forecasting how the ice sheet will react in the future. A third project looks into the glacier’s geophysics by setting off explosive charges to image the sediments beneath the ice, and will use ground-based radars to map internal layering and study the deep ice structure. Another will study the glacier’s widening shear margins, where fast-flowing ice meets slow-moving ice or rock. Two studies will look at the boundaries between the ice and the adjacent sea, detailing melting, water circulation, temperature, and recent history. Another two geoscience projects, involving marine sediments and exposed rocks on nearby mountains will see if—and for how long—the glacier retreated in the past. The Thwaites SCO, based at NSIDC and British Antarctic Survey, will work with all the teams to augment the research by sharing data and resources across groups, facilitating public outreach and media contacts, and encouraging broad integration of the research results into a larger and more complete picture of the glacier and its evolution. Measuring ocean circulation and thinning beneath the floating ice, and the climate processes that drive the circulation. How much, how fast? A decadal science plan quantifying the rate of change of the West Antarctic Ice Sheet now and in the future.